"The steam engine" — more particularly, the "brilliantly tinkered" version developed by James Watt between 1765 and 1776 caused "the biggest and fastest transformation in the entire history of the world … it allowed us to overcome the limitations of muscle power, human and animal, and generate massive amounts of useful energy at will. This led to factories and mass production, to railways and mass transportation. It led, in other words, to modern life." Buckle up: "Now comes the second machine age. Computers and other digital advances are doing for mental power — the ability to use our brains to understand and shape our environments — what the steam engine and its descendants did for muscle power. They’re allowing us to blow past previous limitations and taking us into new territory. How exactly this transition will play out remains unknown…"
In the music industry music CD’s have given way to digital streaming. In the book publishing industry paper-based books have given way to digital downloads. In the banking industry, paper checks have given way to photographs of checks and getting a loan now involves going online and getting multiple "lending organizations" to make their best offer. In the TV industry, cable cutters are dropping their expensive cable subscription and moving to lower-cost, streaming Internet offerings. In the travel industry, human travel agents have given way to self-booking sites and you can now rent a private person’s home — or just their couch — for a day, a week, a month. In the manufacturing industries, automation — robots — are taking over blue collar jobs at a blistering pace. And in the food industry, ice cream cones have given way to virtual ice cream cones — JK, JK, JK. In the computer industry, the cost of a computing device — a powerful computing device – is now comparable to a pair of gym shoes — about one-hundred bucks. Sure, sure: computing devices can he had for more money — but a respectable Chromebook or (respectable Android smartphone!) can be purchased for about $100. Yet, while there are always "new new things" in technology, in the K-12 classroom, the "new new thing" remains the "old old thing:" curriculum. As a Gates Foundation exec puts it: "Research tells us that high-quality, aligned instructional materials is important in helping teachers support their students in mastering the skills, knowledge, and experience they need to be college and career ready." Or, as an observation from a Rand report: "First, teachers need access to high-quality instructional materials aligned with their standards that will support their work to help students meet standards…"
Curriculum — in the hands of human teachers — is still the heartbeat of the K-12 classroom and will continue to be the heartbeat of the K-12 classroom for the foreseeable future. K-12 textbook industry: Sales of K-12 textbooks are plummeting. With the demise of textbooks comes the demise of the teachers’ guides and the elimination of all those handy-dandy, vetted, aligned, and classroom-tested lesson plans. "Pour" into a classroom the (1) elimination of textbooks and the (2) availability of $100 computing devices, stir vigorously, and BINGO: where are teachers going to get the curriculum and lesson plans they need to run their 1-to-1 classrooms? From a Hechinger Report: "… in roughly two-thirds of districts in Common Core states, teachers have developed or are developing their own curricular materials in math (66 percent) and English Language Arts (65 percent)." As one teacher put it: "I had to supplement [the provided curriculum] a lot… It was a lot of searching and finding and printing and trying." From the Gates exec: "A study by the Rand Corporation finds that teachers take precious time hunting for high-quality instructional materials, turning to sites like Google and Pinterest." And, a 2015 study from the Learning Counsel observed that: "… almost 60% of the teachers responding to the survey say they spend between two and five hours a week searching for digital lessons, and almost 10% say they spend six hours or more." An observation from Randy Wilhem, inventor of NetTrekker and Knovation observed: "Everyone knows there is ample OER on the web to instruct virtually any class, but finding quality OER is entirely more difficult than districts anticipated … maintaining the content chosen is in and of itself a challenging task. With around 1 of 5 pieces of OER having some kind of dead link problem within a year, the turnover of content is overwhelming and causes teachers to not trust that the content will be available when needed." And finally, a young, driven, passionate, 3rd grader teacher made this definitive observation: "In the absence of textbooks, individual teachers are forced to spend hours searching the internet for resources. The process is not only time-­consuming, but much of the material online has little to no editorial oversight. With no textbooks, every teacher becomes an improvisational curriculum designer, which they try to do on-­the-­fly while also teaching their classes every day. When this amount of effort is multiplied by all the teachers doing the same thing around the country, it is clear that we are reinventing the wheel, nightly, to the detriment of both the students and the teachers." And, is having teachers create curriculum even a good idea? "[William] Schmidt [Professor of Education, Michigan State University, and a well-respected teacher educator] is among those who are leery of teachers taking on the task of building entire curricula themselves. “It’s a rather elaborate and extensive endeavor to write instructional materials for a whole year, and I think that no one should expect that teachers have the time nor the professional background to do that." So, we ask for the second time in this blog: how are the millions of K-12 teachers supposed to get "high-quality, aligned instructional materials" — aka curriculum? Answer: Look to the Internet — the Great Disruption Enabler. For example, traditional video technology makes individuals only consumers — but the Internet enables individuals to become producers of video, too. There are literally thousands of individuals, today, who are making a living (good to super good) by making videos that are hosted on YouTube! Individuals post comedy, political commentary, etc. on YouTube; those individuals build up a following via social media; YouTube places ads next to those individually-created videos; and those who enjoy the videos may also click on the ads. BINGO! YouTube shares a piece of the ad revenue it collects with the individuals who created those videos. K-12 is already going down the "individuals as creators" path, in fact. With websites like teacherspayteachers.com and edmodo.com educators are being rewarded — financially — for their efforts at producing curriculum. Of course, all the concerns we just raised about teachers creating potentially unaligned and just plain poor curriculum hold. But, if teachers — or districts, even — pay cold hard cash for curriculum, there is some real expectation of quality of product. The entrepreneurial spirit is alive and well in K-12! And, then there is the OER — Open Education Resources — movement, where OER curriculum is free for use. While there are all sorts of real problems with creating and using OER-based lessons, as we noted above, there is still a possibility that OER could blossom. After all, in the software world, open source software — software created by individuals and companies and put into the world for use at no cost to the end user — is a very powerful model. Companies, like Red Hat, give away open source software and make money by providing support, service, and training. As another example: "IBM released as open source its Eclipse platform for creating development tools, a project on which it spent $40 million." Say what? IBM spent $40 million paying salaries, etc. and then gave the software away free? Yes — because IBM made money selling services, support, etc. The entrepreneurial spirit is alive and well in the software industry! Gooru.org, an OER leader, has stated categorically that all the materials on gooru.org "[are] — and will remain — free for students and teachers to use." How does Gooru.org make money then? Philanthropy. The Minnesota Partnership for Collaborative Curriculum has created a pile of free OER courses. A contributor to those courses, Dan McGuire, started SABIER, a non-profit that supports itself by providing professional development on those courses. Yes, OER might well work, too. Before closing, the following pedagogical point needs to be made: The notion of "curriculum" is independent of pedagogy. That is, curriculum can be developed that employs "direct instruction pedagogy" — a type of pedagogy that focuses on information transmission — and curriculum can be developed that employs "inquiry pedagogy" — a type of pedagogy where students are actively engaged in meaning seeking and meaning construction. Now curriculum that employed textbooks — paper-based or digital — has tended to support direct instruction pedagogy. But, as we have argued in previous blog posts, 1-to-1 well supports inquiry pedagogy: Students finally have in their hands the means to answer their questions! We (CN & ES) support, then, the development of digital curriculum for inquiry. 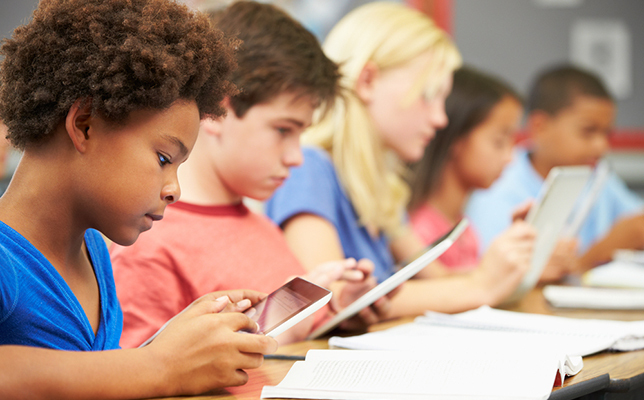 Replicating textbook-based, direct instruction in a digital format is actually a leap backward! Question: How are the millions of K-12 teachers supposed to get “high-quality, aligned instructional materials” — aka curriculum? Answer: While the Internet was in large measure responsible for the demise of paper-based textbooks, that same Internet is enabling new models for development of curriculum. Economists call this process "creative destruction." But, in the words of Brynjolfsson and McAfee: "… How exactly this transition will play out remains unknown …" Stay tuned!